C#, .Net Framework: August 2007 . I am pleased to announce that I have added some extra features in to my search engine www.topicala.com. The two services are currently in Beta, and I encourage everyone to join in. Firstly, Topicala Popular! is designed to help you discover what is popular on the Internet right now. Its kind of like www.digg.com and www.delicious.com but slightly different. To be listed on Topicala Popular, we need to able to track some of the visitors to your site, we do this by asking you to include an image (<img src="http://www.topicala.com/imageRefer/YOURSITEURL/topicala.png">) on your site that is hosted by Topicala, then when ever anyone downloads this image we can tell that it came from your site. Secondly, Topicala People! is designed to help you find people on the Internet. It acheives this by looking at information on your page stored in Microformats, more specifically hCards. There are several ways that you can get your information on to Topicala, all of them are automatic so you have to do as little as possible. Over the coming days these results will be integrated directly into Topicala so that when you search for a topic, you will find all the people associated with what you are searching for. Topicala People will be great for indexing company information too, it will be like an automatic Yellow Pages that is not controlled by Topicala, but rather by you the user. Anyway, I encourage you to get your sites on to Topicala and use the site and let me know what you like, dislike and would like to see changed. It took me a little while to read this book, only because I was busy all the time and never got around to reading it. However, I sat down one evening an went through the whole book. From the outset this book focuses on teaching you to at least think about the performance of your application (there is a whole chapter, most of which seemed to be taken up by pointless code). To be honest it annoyed me a little bit when I was reading it. However, it does prove a point and it stuck with me for the rest of the book. I am a big fan of componentisation when it comes to programming (which is one of the key concepts of the XNA), I was expecting this book not to cover any of this. Luckily, this book is strong in this area, not the for precise details of the API strong, but for pointing out the benefits and sticking to the idea of Game Components and Services. There are several components that would-be game developers could copy straight from the book and use in their own games. 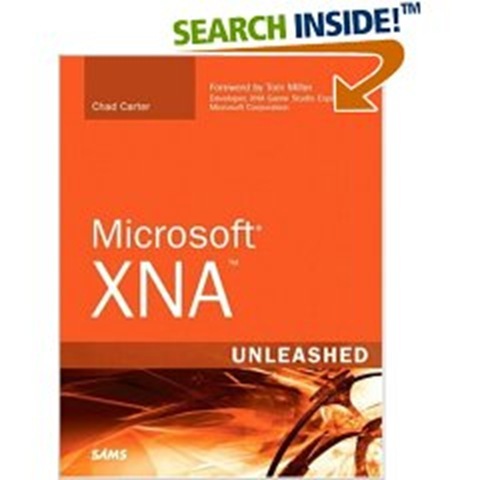 The whole book is at a sufficiently high level for nearly any level of programmer to get started using the XNA with. Before I got this book I was expecting it just to be about the graphics side of the XNA, however I was pleasantly surprised that it is really about how to make a complete game using the XNA. Which is a good thing really, because like myself (and acknowledged at the start of the book) many people who get it to programming, it is because they see a game and wonder how it works. The quantity of pictures in this book describing the output is minute, I would have loved to see more pictures when describing the 2d blending effects and the HLSL examples. The quality of the pictures are very poor too, at a minimum they should have been in colour. There are several non-graphics related chapters: Physics and AI for example. I expected to not like the physics chapter, however, it is short, too the point and gets everything across that you would need to create basic kinetic effects in your games. I really liked it; The AI chapter was too short and only really describes how to follow a game character, this should have been removed or extended because as it stands I thought it was one of the books weakest sections. I really liked his vertex shader and pixel shader introductions and his overview of HLSL (this was one of my weaker areas), however, that is all they are introductions they served me well but a whole book could be devoted to that area. I believe, that if the XNA existed when I started programming (about 14 years ago) and I would have found this book to it would have been a great help to get me gently in to games programming. Therefore, I would recommend this book for anyone who has c# experience and wants to start using the XNA to make some cool games. I would not recommend it to people who have no experience using c#, or are already strong at graphics programming. If you have used either Managed DirectX or Direct X I think you would get more benefit from the help file that comes with the XNA. The timing of this book is a little off, unfortunately Microsoft have just released v2 of the XNA which could make some of this book redundant (for instance, the first chapter is about requiring Visual Studio Express). 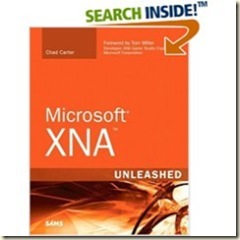 However, I have not delved into it yet (Chad: Is v2 of Microsoft XNA Unleashed on the horizon? I look forward to it). Let me know what you thought of the book! I am looking for people who have small blogs to help me test some new features on http://www.topicala.com/. The software that I am creating is similar to http://digg.com/, but different. :) And is intended to help the "little guy" (you and me) get more people visiting our sites. The new features aren't complete yet, but a basic page has been created and I am working on it daily. So if you are interested, please email me at paul.kinlan@gmail.com, or leave a comment and I will get back to you straight away. I will be also contacting people whose blogs I read to see if they are interested helping the project.